Sue Rodman putting fire on the ground on the Delta Range in 2018. Photo by Tim Mowry. Because the snow is melting quickly this year managers will be ready to go into the field in early to mid- April. 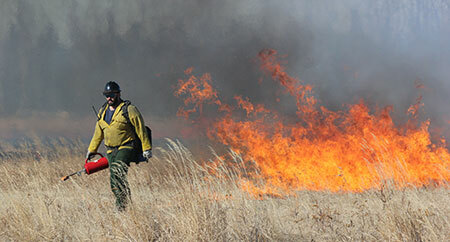 This year, fire and habitat managers are integrating a Terra Torch into the operation. This is a flame thrower mounted on an ATV trailer that helps put more fire on the ground. This is useful in Delta because very little ground fuels exist to carry the fire. Having more fuel in the form of gel is likely to make the operation more efficient than just using standard drip torches. The area getting burned is known as the Gerstle and Panoramic fields and is grassland habitat intermixed with forested wind rows, an area along the Alaska Highway between Mile 1408 and mile 1393. Portions of the area were burned in recent years. On April 22-23, 2017, staff from both state agencies and the BLM burned about 800 acres in the northern portion of the Panoramic Field Complex. In May of 2018, about 300 acres were burned. The aftermath of the burn in 2018. Aspen quickly regenerates after burning, and the new growth is prized by moose. Photo by Tim Mowry. Burning the fields will increase the quality and quantity of vegetative growth. With improved grass production in the fields, bison may be more attracted to the area during fall and winter, benefitting hunters and farmers. 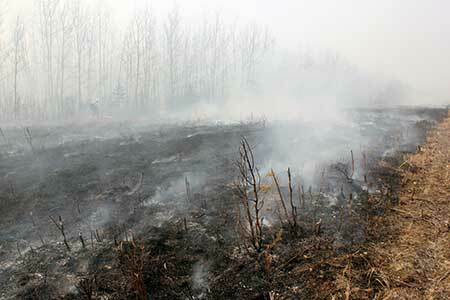 Burning the forested wind rows within the field panels will encourage regeneration of hardwoods. The prescribed fire is expected to produce an uneven burn across both the fields and the forested areas resulting in a patchy, vegetative mixture to include grass, herbs, shrubs, and high-density aspen stands. Bison and moose will benefit from improved forage availability, while grouse will benefit from the regeneration of varying aged aspen stands. 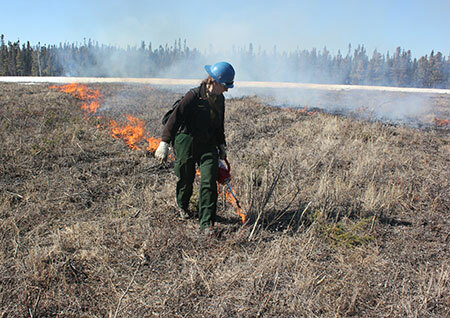 ADF&G biologists are measuring the different effects of prescribed fires on the bison range. One of those effects is the maintenance of the fields. Without fire, mowing and tilling the fields is the only way to keep woody vegetation in check. These methods are costly and time consuming. Considering alternatives, Delta Bison Range Manager Clint Cooper supports prescribed fire as a useful tool to maintain the fields in the bison range from the constant encroachment of woody vegetation. Burning the the Gerstle and Panoramic fields in the Delta Bison Range in 2018. Photo by Tim Mowry. In coming years, ADF&G plans to burn the large forested “islands” within the Delta Junction Bison Range; following that, they will be easier to maintain by roller chopping. This will also provide a degree of hazardous fuel reduction for the safety of residents to the north of the Gerstle and Panoramic fields. Consistent with the Delta Bison Interim Management plan, this project serves to balance conservation of bison and hunting interest with local agricultural land use. It is funded in part by the Delta Junction Bison Range management budget with primary funding from the Federal Pittman-Robertson Act, matched by hunting license and permit fees.